1749 Vaugondy Map of Madagascar. WE SELL ONLY ORIGINAL ANTIQUE MAPS - NOT REPRODUCTIONS JOIN OUR WEEKLY MAILING LIST FOR NEWEST STOCK. Title: Isle du Madagascar ou de St.
Madagascar is presented in detail, labeling rivers, points along the coast, and Antananarivo (Antavare), the capital city. This map was published by Gilles Robert de Vaugondy in his Atlas Universel, Portatif et Militaire in the 1749 edition. Size: Printed area measures 6.5 inches high by 7.5 inches wide. Slight loss along bottom margin. If your address is a P. DHL International EXPRESS (45 USD). We can use your Federal Express Account. 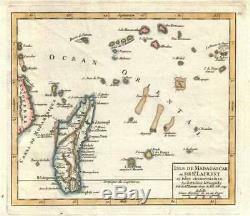 The item "1749 Vaugondy Map of Madagascar" is in sale since Thursday, September 20, 2018. This item is in the category "Antiques\Maps, Atlases & Globes\Africa Maps".